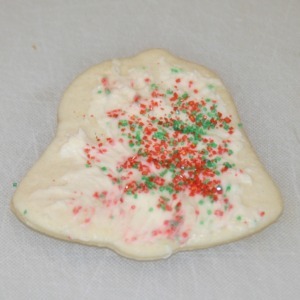 If using large cookie cutters, this recipe can make as few as 12 cookies. If this is the case, please add an extra 5 minutes to the cooking time. 1. Beat butter and shortening thoroughly with an electric mixer or pastry cutter. 2. Add sugar, baking powder and a pinch of salt and mix until well combined. 3. Beat in egg and vanilla then as much flour as you can with the electric mixer. 4. Stir in the remaining flour. 7. Split the dough in 1/2 and roll one half at a time. Cut out with appropriately shaped cookie cutters. 8. Keep the piece you aren't using in the fridge. almond extract; mix well. If icing is too thick, add more corn syrup.